It’s that time of year when everything starts to sparkle a little bit brighter. With twinkling lights along the beachside boardwalks and silver ornaments hanging from displays across the city, it’s clear that the holiday season – and the exciting festivities that come along with it – is upon us. Though the city is blessed with consistently mild weather, Angelenos are no strangers to creating some of the most epic winter wonderlands. With string upon string of colorful lights, spicy mulled cider, and the most magical decorations, neighborhoods from Venice Beach to Tinseltown offer a healthy dose of holiday cheer to locals and visitors, alike. 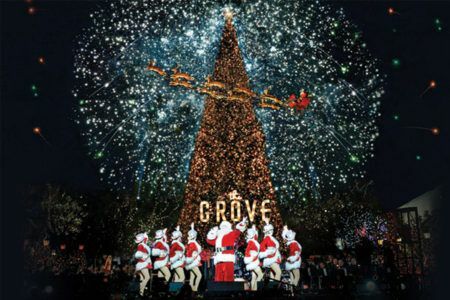 Topping the list of L.A.’s most festive experiences are the seasonal events at The Grove and The Americana at Brand, where snow magically falls twice nightly, holiday music fills the air and two of the West Coast’s tallest trees each gleam with 25,000 lights and ornaments. 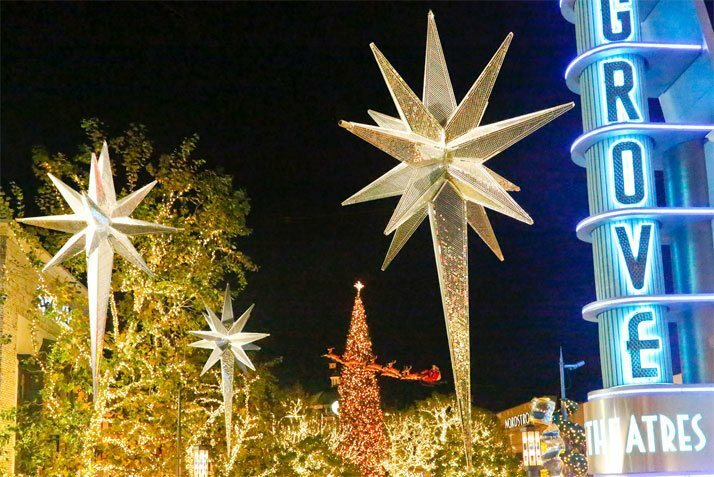 If you’re staying local this November and December, you will want to know more about these can’t-miss attractions at The Grove and The Americana at Brand, plus other events that will leave everyone feeling extra jolly. 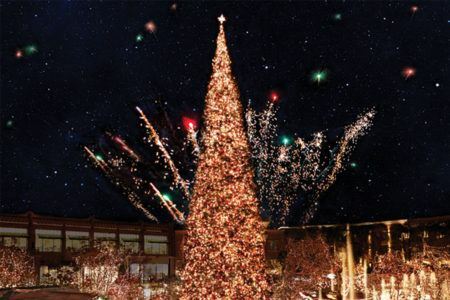 On November 12, at 7:30 pm, experience the lighting of the 100-foot Christmas tree at our annual live spectacular, A California Christmas, featuring music from top performers and entertainment for the whole family. Come witness the season’s first snowfall, a fireworks extravaganza and the arrival of Santa Claus. Starting on November 13, visitors can see Santa Claus daily at the Santa House for a magical holiday experience and professional holiday photos. Other seasonal hallmarks include live outdoor performances by The Top Hats, stirring sounds played by The Toy Soldiers and Belle Air Brass, visits from Frosty the Snowman and The Gingerbread Man, hot cocoa in The Park and so much more. Visit TheGroveLA.com for more details on hours, Santa House reservations and photo packages. Join us on November 16 for the annual tree lighting. The event kicks off at 7:30 pm, and will bring to life a classic Christmas tale, ‘Twas the Night Before Christmas, the season’s first flurries, an important visit from Santa Claus and a grand fireworks finale. Santa takes his post at the Santa House on November 17, when the entire property is transformed into the ultimate holiday spectacle. Each day throughout the holiday season, guests can enjoy a festive brass band, drummer boys, stilt walkers, visits from gingerbread men and toy soldiers, hot cocoa carts, a cappella performances and more. Visit AmericanaatBrand.com for more details on hours, Santa House reservations and photo packages. 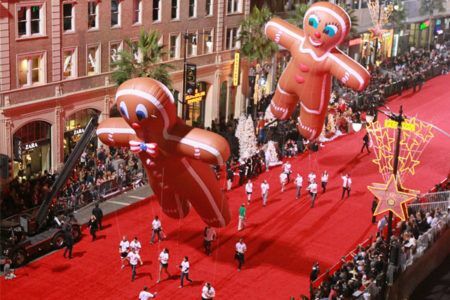 Each year, thousands of Angelenos come out for the kitschy – yet beloved – Hollywood Christmas Parade. The merriment kicks off with a star-studded pre-show concert at 5 pm, before the parade rolls down Hollywood Boulevard, along the Walk of Fame, and then back up Sunset. This timeless tradition features marching bands, seasonal floats, equestrians on horseback, character balloons and the very best in festive family entertainment. Visit the Hollywood Christmas Parade for all the details. This Woodland Hills neighborhood has been coming together since 1952 in an effort to create the most dazzling lights this side of the North Pole. 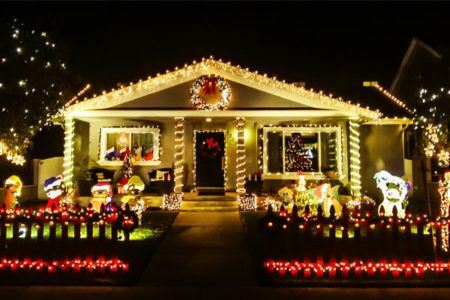 Those who visit the spectacle understand why the stretch of eight blocks near the intersection of Oxnard Street and Lubao Avenue have been dubbed “Candy Cane Lane,” with décor that rivals only a Hollywood movie set. The lights go up on the second Saturday of December and remain there until the end of the year. Visit Candy Cane Lane for more information. A quintessentially Southern Californian stretch of land, the Venice Canals may be just steps from the beach, but they feel reminiscent of a small European town. Add the Christmas lights that are wrapped around the wooden bridges sparkling against the water, and you’re left with a romantic and uniquely offbeat holiday experience. Visit Voice Of The Canals for more details. Start the festivities with a pre-concert party offering free hot chocolate and coffee, then head into the sing-along, featuring everyone’s favorite holiday tunes. Accompanied by a choir, pipe organ and jazz ensemble, this lively event on December 16 is the most musical way to welcome the holiday season. 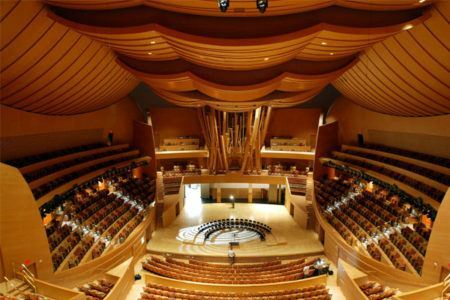 Visit La Phil for more details. This year, from December 7 to December 10, The Music Center is bringing a holiday tradition to Los Angeles with a world premiere of the new George Balanchine’s The Nutcracker, performed by Miami City Ballet. This classic holiday fairytale will feature iconic choreography, magical set design, and performances from both professionals and students from L.A. arts academies. It’s an enchanting favorite that provides the perfect winter celebration for the entire family.